Wi-Fi is noisy. Not only do access points announce themselves ten times a second, but every phone, laptop, and Wi-Fi enabled toaster broadcasts when it wants to join a network. Any time you’re not connected to a network, your phone is spending its time trying to find a network you’ve used before. In general, the way Wi-Fi works on smartphones isn’t very smart at all. But Smarter Wi-Fi Manager makes Blackphone smarter about how it connects to Wi-Fi networks – transparently, automatically, and with almost no setup required. It uses battery power. Having your phone constantly looking for a network keeps the Wi-Fi radio turned on, and that takes energy. Wi-Fi is generally significantly more efficient than cellular data, but it still takes power to keep the radio on and pinging for networks. It’s insecure. 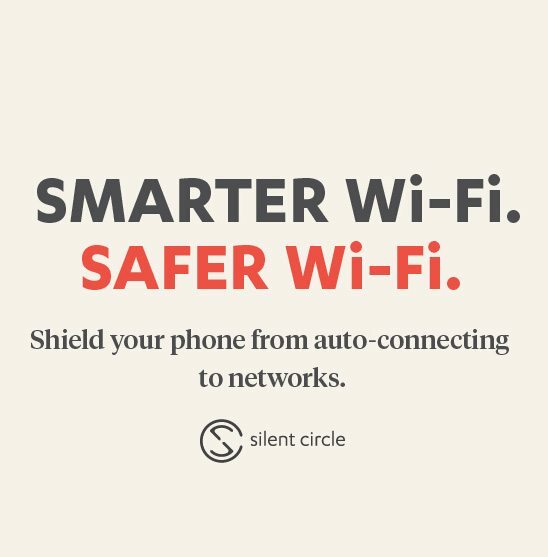 If you’ve ever connected to an open Wi-Fi network (a network with no encryption), your phone will connect to any network with the same name that it sees later on. Because the phone has no way to know that the network isn’t the same as the one you used before, it will connect, wake up all your apps and start syncing data. Hopefully all those apps encrypt their connections, but many downloaded apps do not take appropriate security precautions. There are many attack tools which can spoof open networks and connect to any device looking for a network – like your phone – and easily intercept all the traffic. Perhaps most importantly: It can leak information about you, and allow your location to be tracked! Every time a Wi-Fi device looks to make a connection, it sends a packet called a “probe request”. This packet contains the hardware address (MAC address) of the phone that sends it. Typically the hardware address has no significant meaning – it is configured at manufacture so that no two devices have the same address, but it doesn’t carry any other real information about the user. Unfortunately, since the probe is announced over Wi-Fi, any device can see the packet — and the unique address. This allows listeners to correlate where the phone is seen, as you move about your day while your phone keeps looking for networks to join. Technology based on tracking W-Fi in phones is already in use in major retail stores to track customers throughout the store, and if you make a purchase, the retailer now has a fairly good idea who that hardware address belongs to. Information has value, and once created, tends to spread: How many retailers are then selling this data to advertisers, creating a wide-spread monitoring network correlating what stores you go to, what you buy, and how often you leave without buying something? The regulatory bodies of various countries are beginning to catch up and attempt to prevent some of the more egregious behavior in tracking customers, but information collection is still ongoing. Smarter Wi-Fi Manager works by remembering where you use Wi-Fi, and turning it off when you’re not near somewhere that you’ve used Wi-Fi before. It does this by remembering the ID number of the cellular towers near where you use Wi-Fi. The tower ID is provided by Android without requiring the GPS (saving additional power), and lets SWM know when you’re near somewhere you use Wi-Fi without actually needing to know your location. Say you use Wi-Fi at home and at work; when you leave your house, Smarter Wi-Fi Manager will turn your phone’s Wi-Fi off. Enter the office, and it will turn Wi-Fi back on. The same thing happens in reverse, automatically. Smarter Wi-Fi Manager learns when to turn Wi-Fi on and off by remembering as soon as you connect to a Wi-Fi network. When you move out of range of the network, SWM turns Wi-Fi off completely, until you come in range of somewhere it remembers you’ve used Wi-Fi before. Connecting to a new Wi-Fi network is as simple as turning Wi-Fi on and connecting: Once you’ve connected, Smarter Wi-Fi Manager will start learning. Of course, if you want it to ignore a particular network you’ve used before, like a hotel or coffee shop network that you used just once, you can tell it to forget that network and it won’t turn Wi-Fi on when you’re nearby. Smarter Wi-Fi Manager helps to automatically ensure your phone is only connecting to networks when you know you want to use Wi-Fi, and that you aren’t leaking your movement and behavior to advertisers and retailers, or connecting to hostile honey-pot networks trying to gather network traffic. If you care about privacy, security, and battery life, better control over your phone’s use of Wi-Fi is a good first step. Smarter Wi-Fi Manager can help.